Basic instructions for installing and updating from GitHub can be found in the ReadMe of the Omeka S github repository. 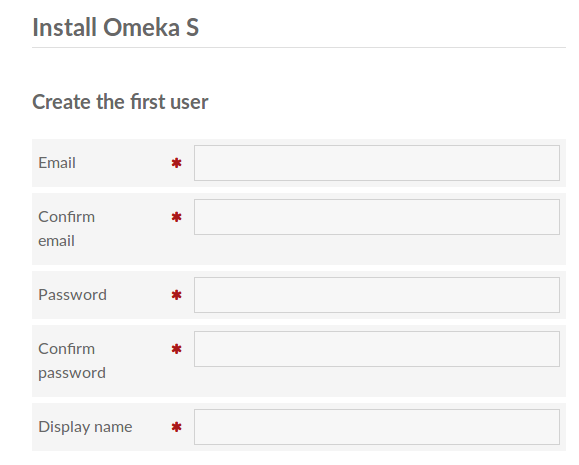 NB: Before you install Omeka S, you need to create a MySQL database and user. Omeka S must have a dedicated database (you cannot use a prefix for a database used by another system or Omeka S or Classic installation). For more information on creating a database and user, please see your hosting's support documentation or talk to your system administratory. Open config/database.ini and add your MySQL username, password, database name, and host name. The user and database must be created before this step. Make sure the files/ directory is writable by Apache. In your web browser, navigate to the admin page for your Omeka S installation (yoururl/admin), where you can complete installation. The first time you to the install site, you will need to enter information for the first user, along with basic information for your install. There are two sections on this page: Create the first user and Settings. an email address, and type again to confirm. confirm the password and type again in the next input to confirm. Note that you can change all of these later in the User management section of your install. select a locale for the language of the admin side of the installation. See Configuration Options for information on settings for thumbnail generation, php path, and more. Make a copy of your /config directory. You will need to restore your local.config.php and database.ini files from that copy. Make a copy of your /modules and /themes directories. Make a copy of your /files directory. Remove all Omeka S files, and replace them with the files from the updated zip file. Replace your original /config/local.config.php and /config/database.ini file, and the /modules, /themes, and /files directories that you copied. In your web browser, go to your site's admin page (yoururl/admin) and run any migrations that are needed. Omeka S does not support proprietary or closed source operating systems. However, for basic development purposes or for quick training, Omeka can run with WAMP, MAMP or similar tools. Follow the standard installation instructions. You will need to make the following configuration changes to the file config/local.config.php to work. First, the php path may need to be set if php. Edit the config file and fill the phpcli_path at line 12 with the appropriate path for your operating system. replace the default thumbnailer Omeka\File\Thumbnailer\ImageMagick by Omeka\File\Thumbnailer\Gd. replace the default thumbnailer Omeka\File\Thumbnailer\ImageMagick by Omeka\File\Thumbnailer\Imagick, and enable Imagick in the file php.ini of your server via the server admin interface or directly in the file. keep the default thumbnailer, but install the command line tool imagemagick and set its directory as value of imagemagick_dir. To install imagemagick, see the documentation of your server. GD is a basic graphic library installed by default with PHP. It can create thumbnails for common image formats only (jpeg, gif, png). Imagick and ImageMagick are the same library and can create thumbnails for more than 200 formats. The difference is that the first is integrated in php and generally older than the command-line version.